Cranes, crane. Reducers, motor reducers. The company offers a wide range of electric hoists and winches, cranes (crane beams) manual and electric, and construction mast lifts, crane CL - 3 (pioneer), gearbox: RAC, RM, VK, GPS, R, W2, CU, CU, RK, CDN, ZDND, CTND, CZ, H, 2H, RGSL; pumps: K, KM, SM, SD, D, CNS, CNSG, Burr, Grak, X, AX, axe, Included GRK; motors: Air, HAM, 4A, AMA, AMS, HLW, BP, GRP, AIMM, D., BACP, PBM, daso, A4, WEAK, VASO, STD, VOS, MTF, MTKF, MTH, MTKH, 4MTM, DMTF; high voltage transformers, brakes TGK - TCH, electromagnetic washers M-22, M-42, M-62 and other industrial equipment. Performed repair of overhead and gantry cranes, hoists, winches, leveling and repair of crane tracks, the recovery model and bulky gear. 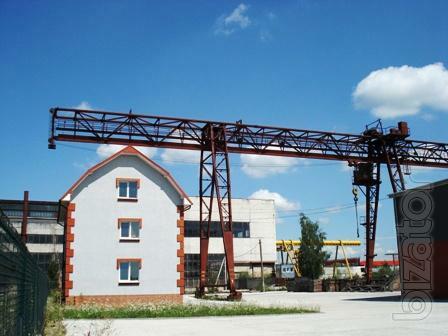 According to the customer carries out works on installation and maintenance of cranes and industrial equipment.